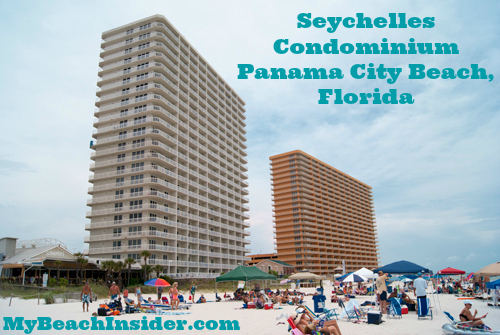 Seychelles Condominium, (the white condo in the picture to the right) is located in Panama City Beach, Florida. 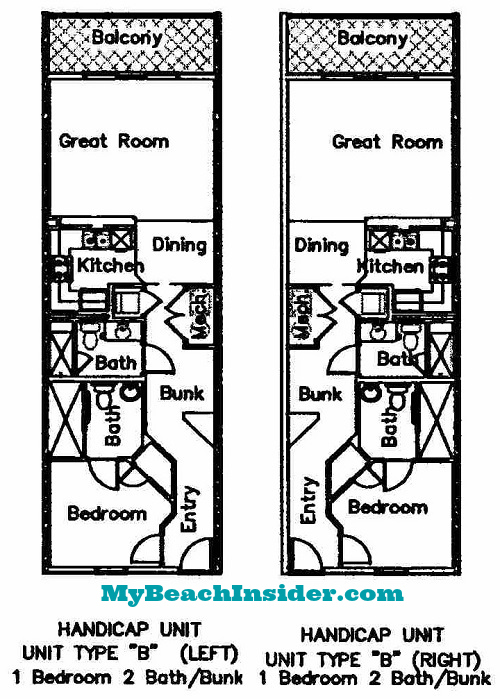 It has five different types of floor plans and four of the five floor plans have a mirrored version. Seychelles only offers one and two bedroom units. They all have two bathrooms and a bunk area in each unit. 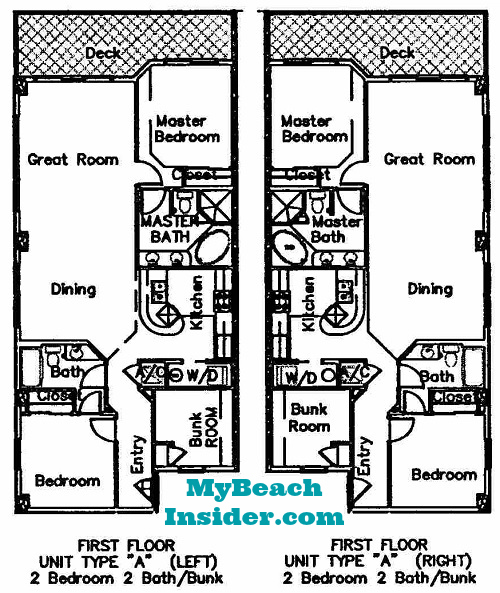 There are two different one bedroom/two bathroom with bunk area floor plans in the Seychelles Condominium building. The first unit is called Unit Type B. There are two versions of this floor plan and they mirror each other. They’re called Unit Type B (Left) and Unit Type B (Right). They are 883 sq ft.
Unit Type B (Left) can be found in units that end in 02, 04 and 07. As you enter the unit, the bedroom will be on your left and a storage closet will be on your right. 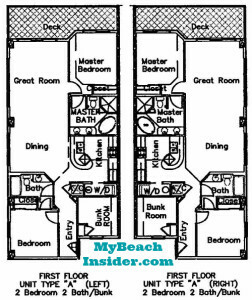 The bedroom has a closet and a private master bathroom with one sink. As you continue down the entrance hallway, the bunk area will be on your right immediately past the storage closet. You’ll see the second bathroom on your left. After the bunk area, a mechanical closet will be on your right and a washer/dryer area will be on your left. The unit then opens up into the dining area and the kitchen will be on your left. Just past the dining area is the great room that has a sliding glass door which leads to the balcony with amazing beach and gulf views. Unit Type B (Right) can be found in units that end in 03, 06 and 08. 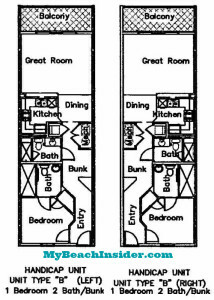 The floor plan is identical to Unit Type B (Left), but it is mirrored exactly. Instead of the bedroom being on your left, it will be on your right and so on. 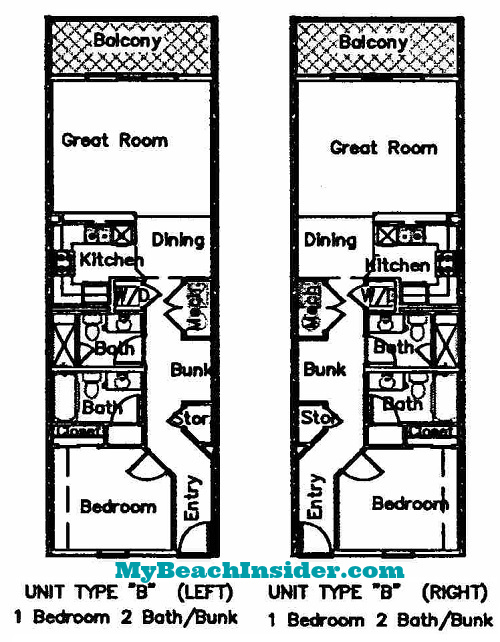 The second one/bedroom two bathroom with bunk area floor plan is 873 sq ft and can be found in units that end in 05. 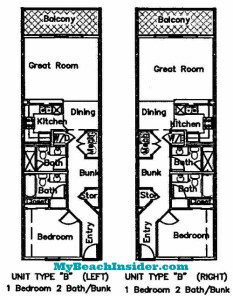 These are called Unit Type C floor plans. While this layout has 10 fewer square feet, I personally prefer this layout. You’ll walk into the unit from the elevator lobby on each floor. As you enter a bunk room will be on your right and a bathroom will be on your left. As you continue into the unit, you’ll find the kitchen on your right and a utility closet on your left. The unit opens up into the dining area/great room space which has a sliding glass door out onto the gulf front balcony. On the left, you’ll have a doorway to a gulf front bedroom. 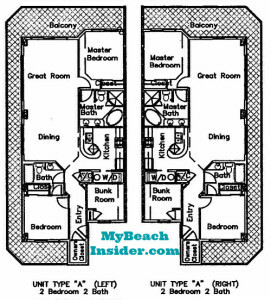 The 05 units are the only one bedroom units with a gulf front master bedroom in this building. As you enter the bedroom, you’ll notice a sliding glass door that leads to the balcony on your right. To the left is access to a dressing area that leads to your master bathroom. The bathroom has dual vanities. Seychelles does offer particular units that have been made to be handicap accessible. Handicap accessible units include the following, according to the builders’ plans: 302, 402, 403 and 506. Please verify with the unit owner if this is important to you before booking a vacation rental. 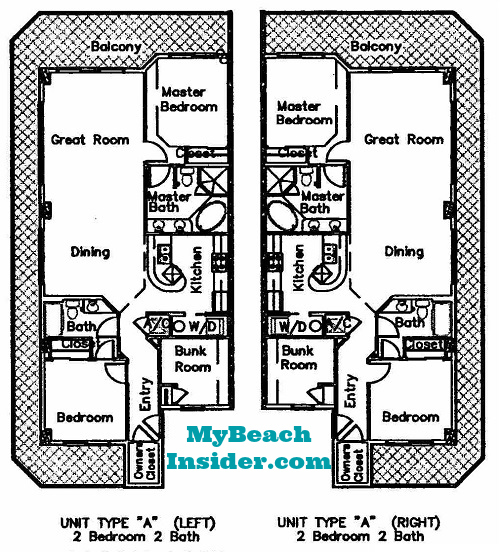 These units are identical to the Unit Type B floor plans listed above with the following changes. When you enter the unit, the entrance to the bedroom will be immediately on your left (or right) on the straight wall. In the original Unit Type B, the entrance to the bedroom is on the diagonal wall. In the bedroom, the closet is now in the corner where the original doorway was. The master bathroom is a bit larger to be made handicap accessible and the bedroom is a bit smaller. There is no storage room in the hallway. See the floor plan image for complete details. Seychelles offers two different types of two bedroom/two bathroom with bunk area floor plans. The first plan is only available on the first floor. The left mirrored version of the floor plan can be found in unit 101 on the east end of the building and the right mirrored version of this floor plan can be found in unit 109 on the west end of the building. These units are 1,394 sq ft.
As you enter the unit, you’ll find the first bedroom on the wall that is straight ahead of you. This bedroom has a closet and access to a bathroom that you share with the rest of the unit since it also has a hallway door. On the opposite wall of the hallway is the dedicated bunk room area. As you walk out of the hallway, you’ll enter the dining area and the kitchen will be off to your side. The kitchen area has a closet with a washer and dryer in it. Straight ahead is the great room/living area and a sliding glass door out to your pool side first floor deck. As you walk into the living area, you’ll see a doorway on the same side of the unit that the kitchen is on that leads to the master bedroom. This master bedroom has its own private bath with a tub, shower and two sinks. The master bedroom also has a sliding glass door that leads out to the first floor poolside deck. The other two bedroom/two bathroom with bunk area layout at Seychelles is available in all other units that end in 01 and 09 on floors 2 through 22. This floor plan is a mirrored floor plan as well. These units are 1,425 sq ft and are called Unit Type A. Units that end in 01 are on the east end of the building and units that end in 09 are on the west end of the building. This is an important note since this version of the floor plan has wrap around balconies. This floor plan is almost exactly like the first floor version of the unit, with the following exceptions. As soon as you walk in the front door of the unit, shut the door and then look behind the entry door. There is a closet that is reserved for the owner. The owner may have turned this into a regular closet. The first bedroom you encounter (on the wall directly in front of you as you enter the unit) has one additional feature the first floor unit does not, a sliding glass door to a wrap around balcony. The wrap around balcony is the biggest difference in these floor plans. In units that end in 01, they’re on the north, east and south sides of your unit. In units that end in 09, they’re on the south, west and north sides of your unit. There are also windows in the living and dining areas that have amazing views on the east side in 01 units and west side in 09 units. The eastern facing units are right next to Treasure Island Resort Condominiums, so the view won’t be as nice as the western facing units. Why? The western facing units don’t have any tall buildings next to them so the view is quite spectacular. The west facing units are right next to a restaurant, Schooners, that often has loud live music in the evenings so you may want to avoid the lower floors if this bothers you. Vacationing In Panama City Beach? Learn More Before You Arrive! I’m local to the Panama City Beach area and want to make sure you’re ready for an awesome beach vacation when you arrive. Make sure to check out the rest of our site, MyBeachInsider.com, to learn more about our area! We share all of the secrets this town has to offer, even what only locals or insiders would know!